Montagne Sainte-Victoire — in Provençal Occitan: Venturi / Santa Venturi according to classical orthography and Ventùri / Santo Ventùri according to Mistralian orthography — is a limestone mountain ridge in the south of France which extends over 18 km (11 mi) between the départements of Bouches-du-Rhône and Var. Its highest point is the Pic des mouches at 1,011 metres (3,317 ft); this is not however the highest point in Bouches-du-Rhône, which is instead found in the Sainte-Baume massif. The Croix de Provence is a notable feature of the mountain. At a height of 19 metres, this cross, although not placed at the highest point of the mountain, stands out from the ridge far more than the Pic des Mouches. The mountain is celebrated for its many appearances in a series of paintings by Paul Cézanne (1839–1906), who could see it from near his house in nearby Aix-en-Provence. 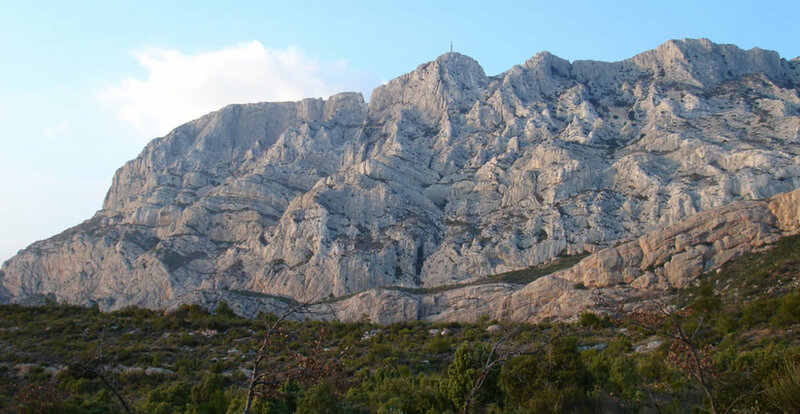 Do you have photos of Montagne Sainte-Victoire or know something about it? Please let us know!